Tickets | Jackson Delta | Market Hall Performing Arts Centre Inc.
Celebrated by critics as Canada's best acoustic blues band Rick Fines, Alan Black and Gary Peeples have garnered a list of awards and accolades over the years including 2 Juno Nominations, runner up in the prestigious Handy New Talent Awards (The first and only entry from outside of the United States), 2 Peterborough Pathway of Fame Inductions, Maple Blues award (Rick Fines), and Wire Megazine awards winners in blues category. They have toured extensively across North America and the U.K. performing at every major Folk, Blues and Jazz festival and along the way providing back up for Colleen Peterson, Ann Rabson and Pinetop Perkins as well as many others. 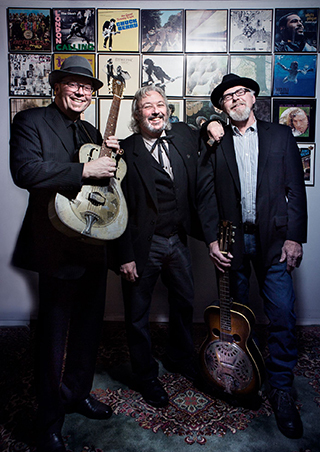 Each member is a force in their own right but together as Jackson Delta they serve up a potent gumbo of the best acoustic blues north of the Mason/Dixon Line.